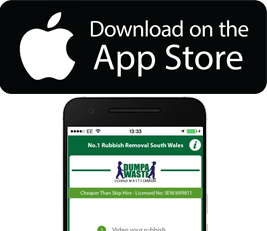 Dumpa waste offer Cardiff, Newport and the Vale an alternative to using a skip plus we do all the work. That's right you don't have to lift a finger, we do everything. 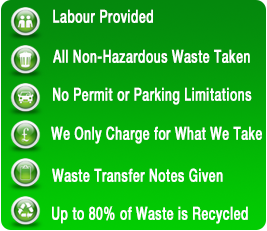 Dumpa waste is a domestic and commercial rubbish removal company that can be trusted. We are regulated by the environment agency of wales and provide a service which is reliable, affordable and good for the environment. Cheaper Than Cardiff Skip Hire! Landlords, builders, plumbers, estate agents, offices, schools, the person living next door we remove rubbish for everyone and have been doing it for many years so if it works for them why won't it work for you! House, garden, office, shed, shop, garage, loft, whatever it is we can clear it all! So Why pay those crazy skip prices and do all the work your self when you can use DUMPA WASTE! All rubbish we remove goes back to our very own waste transfer station where we recycle up to 80% which keeps our tipping bill down enabling us to be the cheapest around.